These days there have been more emphasis placed on personal branding, not just for businesses but also for individuals... This is especially so for entrepreneurs. 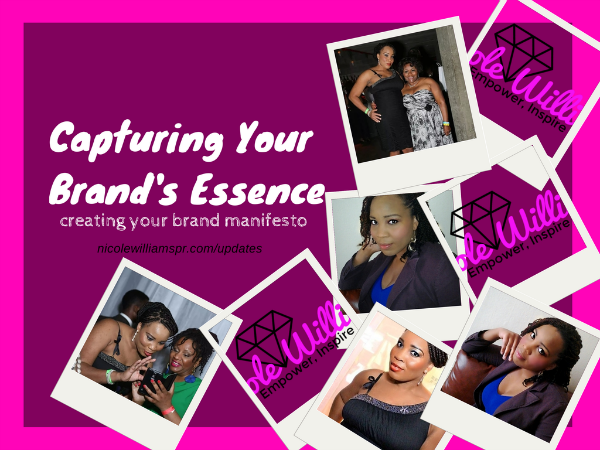 As a MOMpreneur and blogger I have to make sure my brand exudes the personality and voice that potential clients and brand partners can connect with. Carrie over at Female Entrepreneur Association had a fun challenge to help her readers create their business manifesto (aka brand persona). A business manifesto is the heart, soul, voice and personality of your brand? Or simple put, what your business would be like if it was a person. Usually your brand persona is an extension of your individual self or your team as a group. Creating a brand manifesto is a vital part of building a personal brand, as it plays the important role of helping to shape and influence your decisions, behavior and choices. How will your brand personality differ from your competitor's? Once you've identified these two things, then its time to figure out the personality that will resonate with your audience and integrate it in everything for your business - messages, products, services, etc. Describe your business as a person: List your or your team's personality traits. Write your manifesto: Refine and condense what you've written to sum up the essence of your brand. Integrate it: Use this as the blueprint for creating everything. Once you've grasp the essence of who your business is, you'll be able to better connect with your audience, as you'll be making decisions and creating everything for this ideal person.